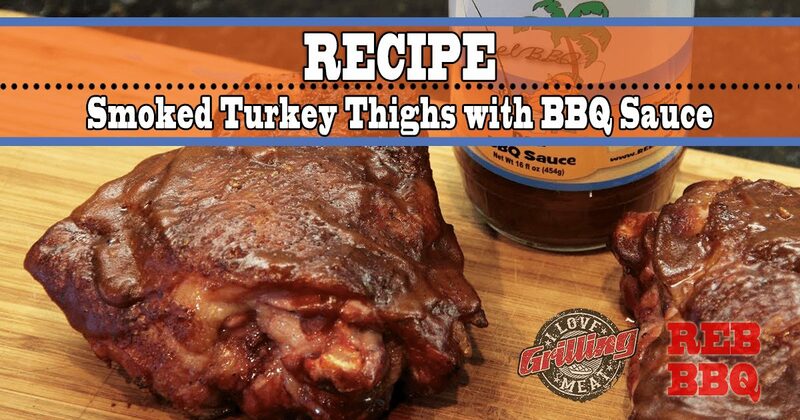 This smoked turkey thighs recipe glazed with a mouthwatering barbecue sauce is so simple, yet so tasty… You have to try it to know how good this cook really is so go ahead and give it a shot. First up, season the turkey thighs with a simple 1:1 salt and pepper mix. You won’t need to do much more, since the BBQ sauce will add a ton of flavor later on. Set up your pit for two zone cooking – one side of the grill will be directly above the heat source, while the other will take advantage of radiant heat to cook at a lower temperature. You want the pit to be in the 350ºF to 400ºF range. Place the turkey on the indirect side. Once you get a good, even color on the thighs, flip them over and keep cooking. Once the thighs are about 10 minutes from being ready, it’s time to baste them with your BBQ sauce! If you like making your own sauce, check out this amazing recipe. Move the thighs a bit closer to the heat source, but not too close, as this might burn the sauce or the bird itself. When ready, rest at room temperature for 15 minutes before serving.